When La La Land's name was read out as the winner of the prize for best picture, that seemed to confirm this year's Oscars as being even more predictable and unmemorable than usual. But two minutes 22 seconds later, all hell broke loose. Later, in the Oscars press room, I asked the official Academy Awards historian, who knows everything there is to know about the Oscars and is on hand to answer journalists' questions, if anything like this had ever happened before. Her eyes glanced down, a sheepish look came over her face, and she replied: "Not that I know of." This just does not happen. This is the Oscars. And this is best picture - the final and most prestigious prize of the night. 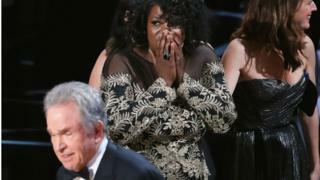 But it has happened - they announced the wrong winner, and 2017 now has an indelible place in Oscars history. 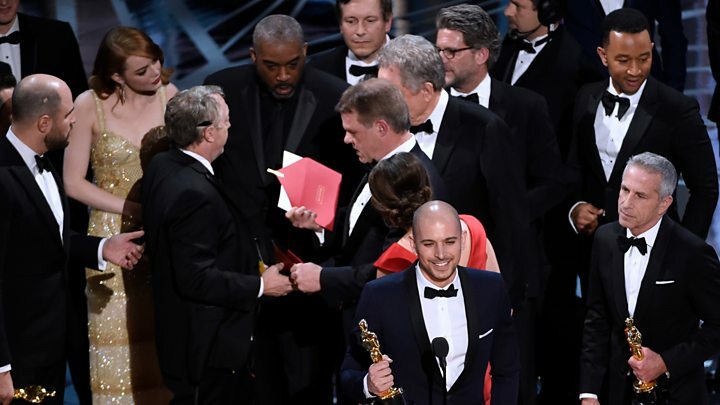 How did the Oscars mix-up happen? Until that point, the biggest upset was Hacksaw Ridge beating La La Land to the award for best film editing. That's how exciting it was. But La La Land was hot favourite to win best picture, so no-one was surprised when its name was read out. Its producers were midway through their well-polished acceptance speeches when hell began to break loose. Perhaps it was worth the mistake to hear La La producer Jordan Horowitz's line, delivered during that heady two minutes 22 seconds: "There's a lot of love in this room, and let's use it to create and champion bold and diverse work - work that inspires us towards joy, towards hope and towards empathy." He could have been referring to Moonlight. And when he was told of the mix-up shortly afterwards, his quick and uncomplaining concession to Moonlight was admirable. "I'm going to be really proud to hand this to my friends from Moonlight," he said before embracing that film's incredulous crew and relinquishing the golden statuette. Every time the TV cameras cut away to a celebrity in the audience, each was wearing the same look - astonishment and disbelief. Unbelievable. La La Land's leading lady Emma Stone was also gracious after defeat was snatched from the jaws of victory - although winning best actress probably softened the blow. In the press room, she seemed unperturbed by the turn of events. "God I love Moonlight so much," she said. "I'm so excited for Moonlight. Of course it was an amazing thing to hear La La Land, and I would love to win best picture. "But we are so excited for Moonlight. I think it is one of the best films of all time." 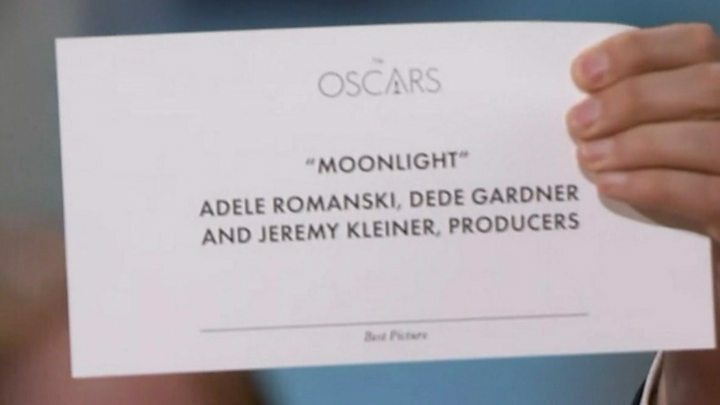 Let's hope, in that case, that Moonlight isn't just remembered as that film that won in that year the Oscars messed up and spoiled La La Land's party. It is a worthy winner, and deserves to be remembered as a beautiful, tender, touching, clever, bold work of art. And let's hope, for that matter, that this fiasco is not forever attached to the memory of La La Land. It would have been a worthy winner too - it is an audacious, magical, transporting cinematic achievement. And the fact that the directors of both films are in their 30s, and have been recognised as major new talents during this awards season, bodes well for future Oscar years. Perhaps there will be a rematch. The commotion also overshadowed the rest of the night's winners, who may have been largely predictable but were no less deserving. Viola Davis and Mahershala Ali were hugely popular best supporting actress and actor victors respectively, and delivered powerful personal speeches. The closest acting race was for best actor - where Casey Affleck triumphed over Denzel Washington, meaning history wasn't made by giving three of the four acting trophies to black stars. However, two African-American winners is a welcome result after two years of #OscarsSoWhite. As well as diversity, the other issue that was supposed to dominate the show was politics. This was meant to be the year when Hollywood railed against Donald Trump. And there were references to the current political turmoil. Presenting one award, Mexican actor Gael Garcia Bernal said: "I'm against any sort of wall that wants to separate us." Moonlight's Barry Jenkins indirectly referred to the president, telling those who feel underrepresented: "For the next four years, we will not leave you alone, we will not forget you." And ceremony host Jimmy Kimmel touched on the topic throughout the night - in a flippant way. The main political statement came when Iranian director Asghar Farhadi won best foreign language film - but was not there to collect the award because he stayed away in protest at Mr Trump's attempted travel ban. Instead, he sent a message saying: "Dividing the world into the us and our enemies categories creates fear. A deceitful justification for aggression and war." The four acting winners completely steered clear of overtly political statements. Image caption Casey Affleck: "I didn't say anything [political] because my head was completely blank"
"Man, I wish I had something bigger and more meaningful to say," best actor winner Casey Affleck said from the podium. Which is funny because he did have something bigger and more meaningful to say when he won an Independent Spirit Award just a day earlier. At that ceremony, he said: "The policies of this administration are abhorrent and they will not last. They're really un-American." So did the actors and actresses chicken out of talking about politics at the Oscars? Or did they realise that preaching would have done little to change minds and would have just alienated half of the country? Affleck told the BBC backstage: "Personally, I didn't say anything because my head was completely blank, [because of] the shock of winning the award and the terror of having a microphone in front of you and all of those faces staring at you." So it won't be remembered as the political Oscars after all. But at least it will be remembered. "Is that the craziest Oscar moment of all time?" Emma Stone said of the best picture debacle. Pause. "Cool! It's going to be history."